Our president and tonal director, Jack Bethards, is internationally known as a pipe organ consultant specializing in evaluating instruments and planning programs for renovations. Jack is a San Francisco Bay Area native and holds Bachelor’s and Master’s Degrees from the University of California at Berkeley. He has been a professional musician and is currently active in the American Guild of Organists. He is past president of the Associated Pipe Organ Builders of America and member of the American Institute of Organbuilders, the International Society of Organbuilders, and the Association Aristide Cavaillé-Coll. He is on the National Council of The Organ Historical Society and serves on the advisory boards of several organ preservation societies. 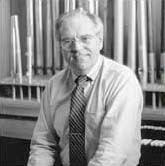 In over 45 years of pipe organ work and research, Mr. Bethards has been a frequent lecturer and contributor of articles to professional journals. A major thrust of his study, including work abroad, has been Romantic organ building in France, Germany, England and America. This is a selected list of Jack's consulting clients. Holy Rosary Cathedral, Vancouver, B.C. The National Shrine, Washington, D.C.
Washington National Cathedral*, Washington, D.C. The Kennedy Center*, Washington, D.C.
© Copyright 2018 Schoenstein & Co. All rights reserved.